TAMPA. FL. — Former Heavyweight boxing champ, Mike Tyson, will bring his one-man show “Undisputed Truth” to the Seminole Hard Rock Hotel & Casino in Tampa on October 25, 2014. He is touring with the show and promoting a book based on his life that will be released Oct. 28. Tickets are on sale now at Ticketmaster outlets, www.ticketmaster.com and the Rock Shop located in Hard Rock Cafe. Source: The Tampa Tribune. Photo shows Mike Tyson performance in HBO’s ‘Undisputed Truth’ trailer. 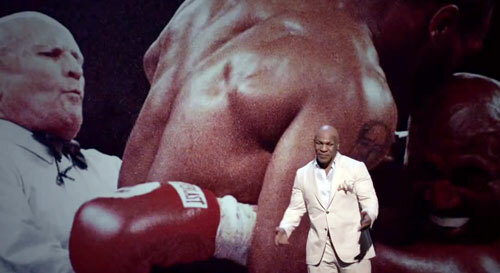 Watch the video trailer of Mike Tyson’s ‘Undisputed Truth’. Mike Tyson is a former undisputed heavyweight champion of the world and holds the record as the youngest boxer to win the WBC, WBA and IBF heavyweight titles at 20 years old. If you would like to book Mike Tyson for a speaking engagement, autograph signing, guest appearance, product endorsement, charity fundraiser or corporate event, contact Mike Tyson’s booking agent for appearance and speaker fees or call 1.855.303.5450.